As I sit here enjoying the various aromas that filter through my home, I realize that most of them are signs of the end of summer and the approach of my favorite season. Autumn has so many unique smells because of the preservation of the harvest and the changes in nature as it prepares for the coming winter. It's a musky, nutty, crisp, "ripe" sort of smell that comes with the cooler nights and sunny days. Right now, the aroma of drying tomatoes, zucchini and apples mingles with tomato and basil pizza, generously topped with parmesan cheese, baking on a bed of mozzerella and homemade crust. An apple crisp with cinnamon and brown sugar waits for it's turn in the oven. We planted a new variety of squash in the garden this year. It's called Sweet Dumpling and is very interesting with green and white strips and speckles covering dips and ridges. They are about the size of a large grapefruit. Yesterday, I cut the tops from a couple of them and hollowed the inside by removing the seeds and pulp. The squash were baked cut side down in a shallow pan with enough water in the bottom to steam the inside. After about 30 minutes, I turned them over and filled the inside with a mixture of walnuts, apples and cranberries tossed with a bit of sucanat, cinnamon and nutmeg. A bit of fresh butter dotted the top and they were baked for 30 more minutes. Lovely! 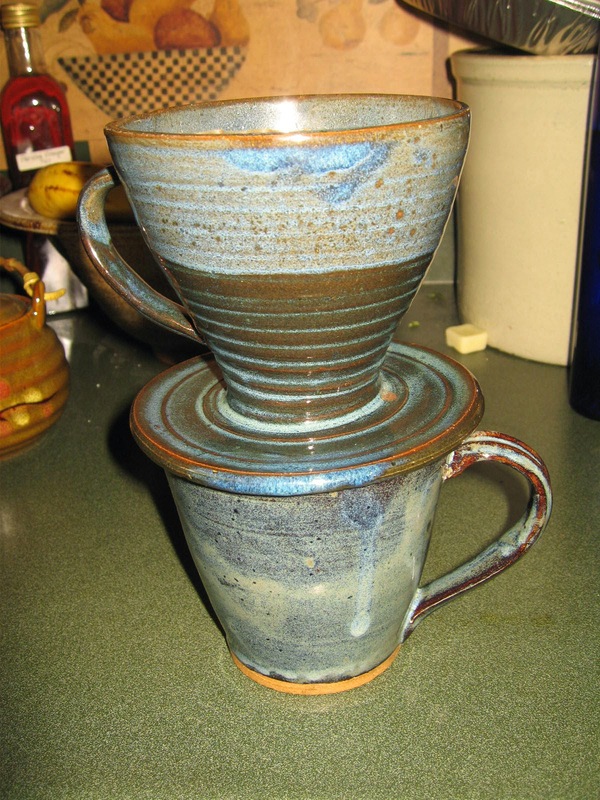 I love to start my latte in this beautiful pour-over combo made by a local artisan. Here's a treat that a friend introduced me to a long time ago. When I became more conscious of what I was eating, I put it aside with regrets. But now I've adapted it to fit into a healthy diet. Well, at least a little better! Think Hot Mocha Cinnamon Hazelnut Latte topped with Whipped Cream! Organic coffee, I prefer hazelnut. Sprinkle with cinnamon or add a cinnamon stick and top with a cherry. Sweeten with a little, tiny pinch of stevia, if desired. Enjoy with a piece of almond biscotti! The sky's the limit for flavorings and you can always add a healthy version of coffee syrups or toppings to make special treats. Move over Starbucks. We're making our own latte at home! This recipe is a nice surprise if you're caught by company without anything on hand to offer them. It looks like you fussed but only you know the truth! Sometimes vapor rub isn't the most convenient treatment for a stuffy head so I developed Clear Head Vapor Salts that can be used day or night and by more than one person at a time. A few years ago, our family was involved in a community theater musical in December, right in the middle of a terrible round of viruses with sore throats and congestion. Every day new folks were coming in with this head cold and since singing and stuffy heads don't mix well, we treated the entire dressing room at once with a large pan of these salts on the radiator! It helped a lot and folks started asking for more! 1Cup baking soda to soften the water and allow the other ingredients to do their thing. 1/2 Cup Epsom Salts to tickle the mucous membranes causing deeper inhalation and oxygen intake. or Borax. 1 Cup Sea Salts to create a saline effect. Mix together and store in a glass jar. Add 1 TBSP to a quart of boiling water in a shallow bowl. Breathe in the vapors being careful not to get too close to the hot water. For intense treatment, cover head with a towel. Vapors may cause tearing due to initial intensity but it's not harmful. Breathe vapors only. Not for irrigating nasal passages. When I was growing up, Vicks vaporub was a common household remedy. Now pediatricians tell us that the vapors are too irritating to the mucous membranes and cause more harm than good. I'm skeptical. I loved the smell of Vicks and the warm feeling I had when I snuggled into the warm towel to breathe in the vapors that did indeed clear my stuffy head or ease my congested chest. Now that we're trying to be more self sufficient and natural in our remedies, I decided to make my own chest rub. We love it and my not-so-little kids ask for it. 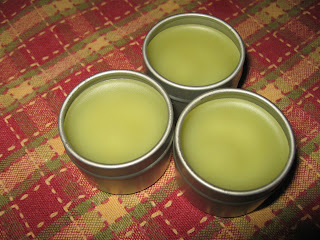 Heat the UN-petroleum jelly in a double boiler over low heat just until it melts. Stir in the olive oil and add the essential oils. Pour into clean jars and cap. Store in a dark cupboard. Apply to chest and back to relieve congestion. Rub on neck for sore throat. Wrap with a warm towel or cover with an old turtle neck sweater to protect from chills. It appears we have blight on our tomatoes! Not the ones I grew from seed but ones that someone gave us. That figures. The rest of the tomatoes seem to be healthy except that they don't have much in the way of fruit. What they do have is very small and green. Ahhhh! I don't know if it's worth putting some sort of row cover over them or not. I guess it might be but I hate the thoughts of it. I think I need a high tunnel for next year. Maybe I can find plans to build one inexpensively. Maybe I"ll design my own. Or maybe I should just get an earlier start on my garden next year. Oh, well. Lots of lovely squash of all kinds.